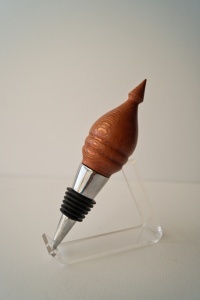 This is a beautiful wine stopper to add to any collection. Macademia nut is a wood not often seen in crafted or tuned objects because the trees are much better suited to nut production. However, the wood is incredibly beautiful. The lacewood-like timber that the tree yields is highly decorative, and perfectly suited for smaller specialty projects. Macadamia Nut is in the Proteaceae family, making it a true lacewood relative, which also includes Silky Oak and Leopardwood.